Gold or silver Ivy headband. This unique piece of bridal jewellery the ivy headband can add a boho feel to your bridal or deb hairstyle. This head band is available in gold, silver and rose gold. An ideal headpiece for a short hair style or if you are planning to wear your hair out in a relaxed style. 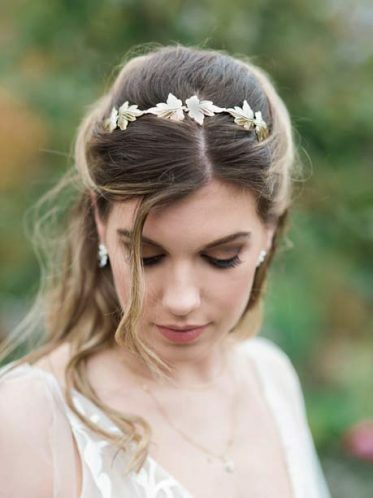 Consider the ivy bridal hairpiece below if you are wearing your hair up. Leah S designs has everything a bride could need including wedding dresses size 6 to 34 in store. Lots of wedding shoes and shoes suitable for debs too. From gorgeous heels to pretty ballet flats.